son) Smith. The father was born in New Jersey in January, 1800, spent his early years in that state and Pennsylvania, and was married in Philadelphia. Twelve children were born of their union. James Smith, senior, was a master sailor and spent sixteen years on the ocean in command of his own vessel. For five or six years he was engaged in mercantile business in Philadelphia and for twelve years he worked in the the ship building yards of that city. His first wife died in 1862, and he was married to his second wife in 1865. At the close of the Civil war he took his family to West Virginia, and in 1870 he and his wife and four children, with his eldest son, came to Hall county, Nebraska, locating on a farm. In August, 1878, he took up a homestead in Custer county, comprising the north half of the northeast quarter and the north half of the northwest quarter of section four, township fourteen, range seventeen, which remained the home farm until the time of his death, in September, 1904. He was always an active man and retained his faculties to a wonderful extent in his latter years, at the time of his death lacking but a few months of one hundred and four years of age. James Smith, junior, worked a few years in the ship yards of Philadelphia and came to Hall county with his father in 1870, and on to Custer county in 1878. He took up a homestead comprising the northwest quarter of section three, township fourteen, range seventeen, and the south half of the southwest quarter of section thirty-four, township fifteen, range seventeen. His half-brother, Joseph Smith, lives on the old homestead of their father, so that the homesteads originally taken by James Smith, senior, and James Smith, junior, still remain the property of the family. In 1904 Mr. Smith took a Kincaid homestead in Loup county and made that his home place until it was proved up. Thus he is a pioneer homesteader of both Custer and Loup counties. On December 20, 1886, Mr. Smith, married Annie L. Buckley, and thirteen children were born of this union, twelve of whom are now living: James R., Elmer E., Nora Annie, Maggie Ellen, Louise May, George F., Alfred W., Bernard L., Date H., Vena, Martha Pearl and Orville. All were born on the home farm in Custer county except Martha Pearl, who was born in Loup county. The Smiths are among Custer county's best known pioneer families and are held in high regard by their many friends and acquaintances. Although a man of retiring disposition and habits, Mr. Smith has always been active along all lines connected with the general progress and prosperty [sic]. He has been successful in farming and stock raising, his occupation for more than forty years, and now owns a well improved and equipped farm in his home place, besides four hundred acres of land in Loup county. One of the eldest citizens of Knox county, is the venerable William Van Camp, now retired and residing in Winnetoon, having come to the county in 1872. At that time Yankton was the nearest railroad terminus, and on arriving there one Saturday, Mr. Van Camp learned that the next stage was due to leave the following Tuesday, so in order to save hotel bills as well as stage fare, he started to walk the fifty miles to Bazile Mills, arriving there in good shape, although a trifle weary and footsore. There he batched it with a friend, Oscar Norton, who owned the half section of land on which Winneton now stands, remaining, for a short time, then taking possession of a homestead lying three miles south of where Verdigris has since been located. He proved up on the land, and also took a timber claim adjoining, all of which he improved in splendid shape, and made it his home until his retirement in 1905. On arriving in the vicinity he learned that there was not a teacher for the schools, so he promised the settlers that he could procure one, for them, and sent for his wife whom he had left in Wisconsin and she came on and took charge of the district school, being one of the very first teachers in the southern part of the county. Mr. Van Camp is a descendant of the old Knickerbockers, who settled on the Hudson river in New York state during Holland's reign over the region. He was born in Herkimer county, New York, on January 16, 1828, his childhood being spent in that locality. When he was seven years old his parents moved to Jefferson county, New York, the father purchasing three hundred and sixty acres of land, which at that time was an unusually large tract in that region. This was devoted to dairying, which they carried on for many years. Mr. Van Camp's father died in 1856, at the age of fifty years, while his widow reached the ripe old age, of ninety, and of their five sons and three daughters, our subject is the last. He was married in Jefferson county, on December 6, 1854, to Harriet Winne who passed away on the home farm in April, 1903, leaving two children, Charles, who is engaged in the elevator business at Winnetoon, and Clara, wife of Willis Brown of Creighton. county, and Mr. Van Camp saw antelope quite often from his farm. During his early manhood Mr. Van Camp was a Whig in politics, but in 1856 changed to a republican when that party was organized. Since that time he has given the party his hearty support, and has always taken an active part in its affairs, both state and national. Mr. Van Camp has been a member of the Masonic lodge since about his twenty-first year, joining the order while living in Jefferson county, New York state. One of the most valuable estates in Stanton county, Nebraska, is the one owned by H. A. Scherer, located in section thirty-five, township twenty-three, range three. Mr. Scherer is one of the most prosperous farmers of this part of the state, and has been a continuous resident of this county for a long term of years. Mr. Scherer was born in 1860, at Frankfort-on-the-Main, Germany. His father, Henry Scherer, was a farmer and overseer of a factory where fur hats were manufactured. When our subscriber was a child of three years, they left their native land and came to Pennsylvania, where they remained until 1869. At this time, they came to Stanton county, took up a homestead, and prepared to make it their permanent home. A dugout was built in which they lived for two years. Later when they determined to build a frame house, they had to haul the lumber from Omaha, paying forty dollars per thousand feet. For a while they had a hard time to make a living, as the grasshoppers destroyed their crops for several years in succession. Finally, things began to brighten somewhat, and they began to add one improvement after another to the farm, so that now it is one of the well-known estates of the county. From time to time, as circumstances seemed to warrant, Mr. Scherer has added to his landed possessions until now he is the proprietor of six hundred and eighty acres of the finest land to be seen for miles around. In 1884, Mr. Scherer was married to Miss Kate Haley. Six children have been born to them, all of whom are living. They are named as follows: Frank, Max, Earl, Mary, Minnie, and Alfa. Mr. and Mrs. Scherer are both well-known socially, and are favorably regarded by everyone with whom they have come in contact. Prominent among Antelope county's worthy citizens is the gentleman above mentioned, as he has been largely instrumental in bringing about the present financial and commercial prosperity. Mr. Hoyt is a, progressive farmer and is well known throughout Antelope. county as a successful agriculturist, and is highly esteemed by all who know him. Mr. Hoyt is a native of New York, and is the son of Henry and Abagail (Rosco) Hoyt, both natives of New York. Our subject grew to manhood in his native state, when he decided to go west to Iowa, he having found he could get land cheaper in the west, and thinking it a better place for a young man to get a start in life. After residing four years in Sioux county, lowa our subject came to Antelope county, Nebraska, in the spring of 1882 and took up a homestead claim in section eight, township twenty-four, range eight, on which he built a good frame house. Mr. Hoyt was married in 1868 to Miss Louisa June, and Mr. and Mrs. Hoyt are the parents of four children, whose names are as follows: Anna L., who is married to Mr. Nathan Prosser; Andrew J.; Oliver H., married Miss Hannah Smith; and Mary A., wife of Irvin W. Wilson. Mr. Hoyt sold his homestead and bought eighty acres of land on which was a small house to which a goodly addition was built in the fall of 1910. He and his family enjoy the respect and esteem of the community in which they dwell. George O. Waters, of Broken Bow, Nebraska, has for many years been prominent in connection with the work he has done in the interests of agriculture and horticulture in his county and state. He has in many ways been conspicuous in furthering the development and progress of central Nebraska and has given freely of his time and means in this cause, being especially interested in educational measures. He has been a resident of the county from the days when the coffee mill was often used to grind grain for making bread until the present day, and was one of the earlier settlers of Custer county. Mr. Waters was born in Preble county, Ohio, May 30, 1849, the second born child of Isham and Rachel (Cassat) Waters, who had four sons and two daughters. The father was a native of Kentucky and the mother of Ohio. In 1852 the Waters family moved from Ohio to Clinton county, Indiana, going onto a heavily timbered farm. In those days Indiana was but sparsely settled and the father helped very materially in the development of his part of the state, where he was one of the pioneers. He enlisted in Company I, Tenth Indiana Volunteer Infantry, in 1862, and remained in the service about fifteen months, receiving an honorable discharge on account of physical disability. He then returned to Indiana and in the spring of 1865 went with his family, which consisted of his wife and their five children, to Clark county, Missouri. resident of the state. The parents came to Custer county and there the father died, the mother passing away in Otoe county. Besides. George O., there are three sons and two daughters now surviving, but the only two who have retained their residence in the state to the present time are George and his sister Mrs. John Saner, of Nebraska City. George O. Waters remained with his father on the home farm until September 10, 1867, when he enlisted in the United States army at Keokuk, Iowa, and later he was assigned to Company F, Thirtieth United States Infantry, and in the spring of 1869 to Company H, of the Fourth Infantry, the fourth and thirtieth regiments being consolidated at that time. He was discharged at the end of his term of enlistment, in September, 1870. He had served at Fort Sedgwick, Colorado, and Fort D. A. Russell, Wyoming, also at Fort Steele, and received his discharge at Fort Fetterman. He had been engaged in frontier service among the Indiana during his term. After his discharge he returned to the home farm in Missouri and he was married on Christmas day, 1870, to Elvira Storey, daughter of Greenberry and Amie Ann (Carman) Storey, a native of Missouri and her parents natives of Kentucky. After their marriage Mr. and Mrs. Waters lived on the Missouri farm until the spring of 1879, a period of more than eight years. On April 21 Mr. Waters left Missouri and moved with his family to Custer county, Nebraska, arriving there May 12, 1879. They came with a team and covered wagon and secured a homestead seven miles north of Westerville on the northwest quarter of section thirty-four, township eighteen, range eighteen, where they lived until the spring of 1888. At that time Mr. Waters moved to Broken Bow and for four years served as deputy clerk of the district court. In December, 1889, Mr. Waters and his family moved to their new home one mile east of Broken Bow, known as Willowbrook farm, and located on section thirty-three, township seventeen, range twenty, which is still the family home. Nine children have been born in the family, six of whom now survive, the first four born in Missouri: Harry L., deceased; William W., Charles F.; Edward L., deceased; Robert E., George H., Clark S., Elvira May, and an infant who is deceased. William W., a young business man of Broken Bow, is married and has three children; Charles F., in business in Eddyville, Nebraska, has two children; Robert E., married and living on a farm near Westerville, Custer county, has three children; George H. and Clark S., unmarried and living at home; Elvira is the wife of Bert Oxford and lives in South Dakota. The family is among those of the early ones that are well known and popular in Custer county, and Mrs. Waters, as well as her husband, has always stood for the best interests of the county and state. Her parents are now deceased. Her father came to Missouri in pioneer days in that state and spent the remainder of his life there. The homestead in Missouri is still in the possession of the Storey family. During the past year Mr. Waters has been a member of the county board and he had previously held various township offices. He has also served as a member of the school board of Broken Bow. He was one of the organizers of the Custer county agricultural society and served several terms as its president. He is an enterprising and progressive farmer and has won success in his ventures. He has a comfortable modern home, surrounded by a nice lawn and shade trees. When the family first came to this place the land was covered with corn stalks, it is now in a high state of cultivation and imporvement and reflects credit upon its owner. Mr. Waters is prominent in the Knights of Pythias order, being a member of the lodge at Broken Bow. Among the younger members of the farming community of Valley county, Nebraska, none are better known or command a higher place as a progressive farmer and stockman than the gentleman named above. He has one of the finest farms in the county and has met with marked success in both farming and stock-raising. Mr. White was born in Wisconsin on the fourth of March, 1867. He was the tenth in a family of twelve children born to William F. and Catharine (Clark) White; seven of these children are still living. The father was of English and Irish descent, a native of Massachusetts and died in this county four years ago. The mother was Mr. C. R. White's second wife, was of German extraction; she died in 1896. When Frank White, as he is usually known, was only three years of age, the family came to Nebraska, settling first in Otoe county and later in York county, so that he has been a resident of the state ever since he could remember. He received his education in the local schools of the latter county, and assisted his father about the farm when not in school. In 1890, he came to Valley county, and engaged in farming for himself. On August 27, of the year following, he was married to Clara Coleman in David City, Nebraska. She is a daughter of James and Elizabeth (Taylor) Coleman. raising the usual crops, Mr. White has given a great deal of attention to stock-raising, and in is departure he has met with signal success. He has always taken a commendable interest in local public affairs, and has served the community in many and various capacities. For twelve years he was justice of the peace, while he was moderator of his school district, number forty-three, for a number of years. He has also held various township offices. In fact, he has been in many ways an important factor in the progress of the community. Five children have been born to Mr. and Mrs. White, four of whom are living: Vain, died in infancy, while Paul J., Myrtle E., Earl L. and Ellen M. are all at home. Both Mr. and Mrs. White are deeply interested in the educational and religious life of the community. They are members of the Friends church, and for nearly five years they, conducted a Sabbath school in the neighborhood, of which Mr. White was superintendent until failing health compelled him to abandon his post. He is a prohibitionist in political views, and both are members of the Women's Christian Temperance Union. They have enjoyed the pioneer privilege of living in a sod house from time to time, and occupied one on their present place until 1903, when the dwelling shown in our illustration was built. They endured the losses consequent to grasshopper raids, chinch bugs, hail and drouth. In 1894 their entire harvest consisted of less than twenty bushels of wheat, and fifty bushels from an eight-acre field of rye. Corn bread and water constituted their only food at times. A few deer and antelope were on the prairies when they first came, but these soon disappeared. 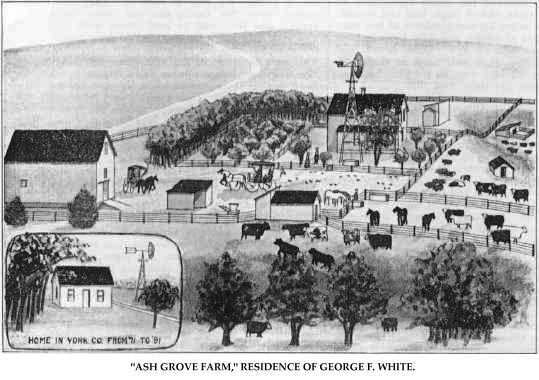 "Ash Grove Farm," Residence of George F. White. Joseph M. Giddings is well known throughout Custer county as an energetic, successful farmer and stockman. He was born at Hebron, McHenry county, Illinois, September 4, 1841, second child of George and Harriet E. (Montague) Giddings, who had two daughters and four sons. The Giddings family left Illinois in the spring of 1846, and moved to Winnebago county, Wisconsin, being pioneers of that region. The father purchased a large tract of land there, and the family lived in that county many years, the subject of this sketch being educated there. Two daughters and one son of the family still live in Wisconsin, the daughters in Winnebago county and the son at Fond du Lac. Joseph Giddings was the only one of the family to come to Nebraska, which, he did in 1878, driving through by team. Starting on the first of March, accompanied by Frank Kimball, he did not reach his destination before the second of May, the roads being in such a fearful condition. He went to York county, raised two crops there, and in the spring of 1879, took up a homestead on the northwest quarter of section seven, township sixteen, range seventeen, in Custer county, where he resided until 1911, when he became a citizen of Ansley. In the early days, Mr. Giddings experienced the same hardships and adversities as other pioneer settlers. Grand Island was their nearest trading point, and it was a trying thing to make the four-day trip, which he did many times with an ox team. He well remembers the dry years, the years of panic, and the times when they used a coffee mill to grind corn and wheat meal for their bread. He had always been in pioneer surroundings since he could remember, as he was a small boy when the family moved to Wisconsin, and he has a vivid recollection of going with his father, driving a yoke of steers, to the small trading post called Chicago, seventy-five miles distant from their home. Mr. Giddings did not attend the sale in the neighborhood, January 12, 1888, the day of the worst blizzard in many years, but Ira, his son, then a lad, was present. Messrs. Willard and Frank Kimball, neighbors, were present, however, and took the boy home with them, where he remained over night. Mr. Giddings can never forget the three-days' blizzard of October 15, 16 and 17, 1880, which began the winter of the deep snow. His well drifted full of snow, and was never used again, for in melting, it caused the well to cave in. They used melted snow for family use and stock until spring, and then had to haul water until fall. The man who had been engaged to bore a well for them in June did not come until November. This well has been in use ever since that time. The Giddings' first residence was a dugout in the bank west of their present home, the spot hidden by a plum thicket. This was followed by a sod house, and by a second one, in which the family lived until 1908, when the present neat frame dwelling was built. Mr. Giddings was married in Winnebago county, March 1, 1871, to Miss Julia Sperry, a daughter of Rais and Sarah (Lilly) Sperry, both natives of Ohio. Her father and a brother came to Custer county about 1881, settling on the Mitchell farm in Myrtle township, of which her brother owns one hundred and sixty acres at this time. Mr. and Mrs. Giddings have two children: Lilly, wife of Sylvester Lee, lives at Ronan, Missoula county, Montana, has eight children, and Ira R., the youngest, took over the management of the farm in 1911, when the parents purchased a comfortable cottage in Ansley, and retired from active life. on guard duty on the Iron Mountain railroad, below St. Louis, for a number of months, then went to the front. Their first important battle was at the Siege of Vicksburg, and they afterward went down to New Orleans, and on to Berwick Bay. Here, at Brazier City, Mr. Giddings was taken ill, after four days of continuous picket duty in the rain. He was sent to the hospital. rejoined his regiment when able, and, with it, participated in many engagements, becoming a veteran. After his discharge, he returned to his Wisconsin home. Mr. Giddings is a republican in politics, and has been a delegate to every county convention but three since coming to the county, and was a member of the first board organized to frame the herd law. He is a comrade of the Grand Army of the Republic. 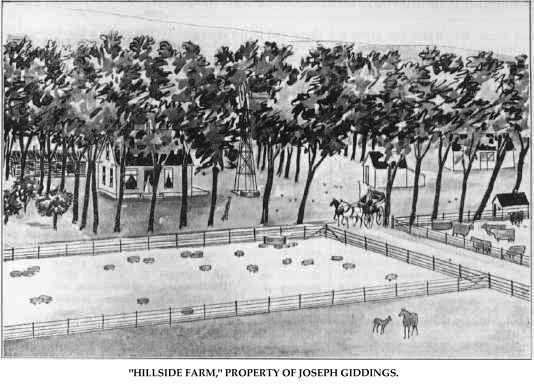 "Hillside Farm," Property of Joseph Giddings. August J. Hoehne, of Osmond, Nebraska, is a native son of this state, and has seen the many phases of progression during his lifetime. He has contributed his share of energy and qualifications to the upbuilding of the state, and is now a dealer in implements in Osmond, Nebraska. He was born in Cuming couty [sic], November 26, 1865. His parents, John and Caroline (Brietkreutz) Hoehne, natives of the kingdom of Prussia, came to America in 1859, lived four years in Wisconsin, and then came west to Cuming county in 1863. They settled on a homestead, and also filed on a preemption claim, on both of which they proved up and received clear title. Their first house was of logs, and their first stable, or shelter, for stock was of straw, with a roof of same. Later a more substantial. barn of logs was erected, and eventually a commodious dwelling and a better barn. The first school house was made of mud, pressed down between parallel frame work of willows, and later was covered with siding on the outside, and was plastered on the inside, making a very presentable building, which answered its purpose for thirty years. They were there in time to suffer all the grasshopper raids, losing all their crops two or three years, and much of them several other years. Mr. Hoehne's father died, October 25, 1877, and he remained with his widowed mother until he was twenty-six years of age, when he started out for himself, opening an implement house in Wisner which he conducted profitably for three years, weathering the panic of 1893. Receiving a flattering offer from the Deering Binder Company, he was their salesman and collector for three years, and represented the McCormick company the two years following, covering territory throughout Iowa and Nebraska. He again entered the implement business, opening an establishment in West Point in 1900, and on October 25, 1902, transferred his interests to Osmond, disposing of his business in the summer of 1910, and retiring from business. Here he built a large two-story dwelling, one of the most pretentious in town of a very pleasing style of architecture, which was his residence while living in the town. Mr. Hoehne was married in Osmond, Nebraska October 23, 1907, to Miss Nellie Farrow, a native of Washington, Illinois, daughter of Benjamin and Louise J. (Good) Farrow, who came to Nebraska in 1884, and settled on a farm, six miles east of where Osmond now stands. Pierce was their trading point and nearest town. One daughter, Harriet, has been born to Mr. and Mrs. Hoehne. Mr. Hoehne is a democrat, and is a member of the Ancient Order of United Workmen, and has been initiated into the Masonic order. Mr. Hoehne has vivid recollections of the early days, when he first knew Nebraska, the grasshopper raids, blizzards and prairie fires. A half brother, caught in a blaze of burning grass, was so severely burned on the face and hands that for a time it was feared he would be permanently disfigured. One year, when preparing a Marsh harvester to begin cutting the ripened grain, the machinist, who was at work, looked up, and noticing a cloud in the northwest, remarked: "You will cut no grain today; see that cloud?" Within a short time the cloud approached, and descended a cloud of grasshoppers, which before night left no grain to cut; nor was there any corn left in the fields. So numerous were they that the sound of their eating and of falling leaves could be distinctly heard at quite a distance from the fields. It seems odd in these days of high prices to hear that a little over thirty years ago grain was hauled a hundred miles to Omaha, where twenty-five cents was the best price paid for it, the trip sometimes requiring ten days or two weeks. During the blizzard of 1881, Mr. Hoehne, as a boy, was herding sheep for a man in Wayne county. Owing to having only partly finshed [sic] sheds, half of the sheep were lost. In the blizzard of January 12, 1888, he was living with his mother on the home farm, but found no necessity for going out into it. Children of the present day have little conception of what their father's and grandfathers endured in the pioneer days of the west. Frank J. Taylor, a successful and leading attorney of Howard county, is a prominent man of affairs in his section of the state. He was elected county attorney in the fall of 1892, and held that office for six years. In 1903, he received the nomination and was elected to the same office, serving for one term, and again re-elected in 1908, holding the office at the present time. He has also held the office of city attorney for four one year terms. Mr. Taylor is a native of Ashton, Illinois, born February 12, 1866, and is the eldest of five children in the family of John P. and Susan Taylor. The Tayolrs [sic] lived in Ashton up to 1879, at that time coming to Sherman county, Nebraska, where our subject received his early education, and later attended the St. Paul high school, after which he entered the law office of Darnell & Kendall in that city, and in June, 1890, was admitted to the bar of Nebraska. He also took a law course at the University of Michigan, graduating with his class in 1891, returning to St. Paul, and forming a partnership with A. A. Kendall. Together they built up a large general practice, and after a short time, Mr. Taylor opened an office by himself, and has continued practice up to the present time. During his career in this section, Mr. Taylor has gained a high reputation as a public official and good business man, and has built up a nice property, having a handsome residence and considerable interests in different enterprises in the county. Mr. Taylor was married, June 27, 1895, to Miss Byrdie E. West, at the home of her parents in St. Paul, where she was born and reared. They have two children, Harold and Burdette. Mrs. Taylor's parents, G. W. and Emma (Johnson) West, came to Howard county in 1871. Mr. West was among the first settlers in Howard county, and had one of the first store buildings opened in St. Paul. In 1907, Mr. Taylor assisted in the organization of the First State Bank of Dannebrog, and the First State Bank of Farwell, Nebraska, and in 1908, was one of the purchasers of the Cushing State Bank. In 1909, with others, Mr. Taylor purchased the Citizens National Bank of St. Paul, and is now president of each of these institutions, all of which are situated in Howard county, Nebraska. In addition to his banking interests, Mr. Taylor is extensively interested in Nebraska farm lands, being the owner of twenty-four hundred acres, all in the vicinity of St. Paul. Oscar W. Enger was born in the city of Christiana, Norway, August 30, 1856, and was the youngest of three sons in the family of Hans Peter and Christina Maria (Ebling) Enger. The father died in 1858, and the mother later married Rasmus Hansen, and to them one son was born, Emil Hansen. In the fall of 1868, the family came to the United States, saling [sic] from Christiana to Hall, England, and embarking at Liverpool in the "Minnesota," which landed in New York, after three weeks of stormy weather. The family consisted of Rasmus Hansen and wife and son, Emil, and Fred and Oscar Enger. The eldest Enger boy, Christ, was a sailor, and away from home at the time, but joined the family in Nebraska a year later. The family settled in Dodge county, Nebraska, in October of 1868, renting a farm, and in the same fall, Mr. Hansen homesteaded one hundred and sixty acres in Cuming county, and in the spring of 1869, began improving the homestead, on which the family moved the following winter. In the fall of 1869, Mr. Hansen died, and Mrs. Hansen and the family remained on the homestead until proving up on the claim. Mrs. Hansen remarried, and died in 1881. Oscar Enger remained with his mother until the spring of 1874, and then went to Fremont, and worked for one of the wealthy business men on his country place in the edge of town. In 1878, he went back to Cuming county and the old homestead, and began farming for himself. He farmed and raised stock for three years, then sold his interest in the homestead, and purchased one hundred and sixty acres of farm land in Colfax county, twelve miles northeast of Schuyler, living on that farm until September, 1892. He then sold this land, and bought a farm in York county, which he kept but a short time, and purchased land in Hamilton county. In the spring of 1895, Mr. Enger sold his Hamilton county farm, and purchased one hundred and sixty acres of land in section nineteen, township twenty, range thirteen, in Valley county. This was a raw tract of land when it came into his possession, but Mr. Enger has greatly improved same with a commodious dwelling, good buildings, groves and orchard. Mr. Enger was married to Miss Martha Watt in York county, July 30, 1892. Miss Watt was born in Nebraska, and is a daughter of Jepp M. and Hancena Watt. Mr. and Mrs. Enger have four sons living: Henry J., Clarence, Raymond and Ivan, all of whom reside under the parental roof. Mr. and Mrs. Enger and family are one of the well known families of Valley county. Mr. Enger has in past years held township offices, and is active in leading toward the uplifting of his county and state along progressive lines, and has had something to do with the advancement of the several counties mentioned. the northeast quarter of section twenty-five, township twenty, range fourteen, and own in all twelve thousand and eighty acres of farm and grazing land. Mr. Enger, subject of this sketch, is a self-made man, and is now one of the prominent and successful farmers and stock men of Valley county. He has suffered many hardships and deprivations in the development of the west. He lost nearly all his crop by drouth in 1893, and experienced worse losses the year following. During the early years when developing his homestead, Mr. Enger lived for a time in a "soddy." Deer and antelope were to be seen here during the early days and game birds were to be seen in myriads. Mr. Enger happened to be on the train between Fremont and Schuyler at the time of the great blizzard of January 12, 1888, and so severe was the storm that the train was all afternoon making the distance between the two towns. Carl Prauner, whose settlement in northeastern Nebraska took place when this region had barely been opened up to the emigrants who were looking for a fertile part of the country to locate and build up good homes, is now well known as a prosperous farmer and worthy citizen. Mr. Prauner was born in Germany, March 24, 1850, and was sixth of seven children in the family of Martin and Mary Prauner, who had four sons and three daughters. In company with his elder brother, John Prauner, he came to America June 1, 1869, and upon arriving in the United States traveled westward, locating in the central part of Madison county, Nebraska, where they took up adjoining homesteads. Mrs. Rosa Ketteman, a sister, had come to America in the spring of 1868 with her husband, who died in Madison county in the fall of 1868. Mrs. Ketteman later on married again and is now living in Madison county, her name being Mrs. Rosa Lucht. So far as Mr. Prauner knows, brother John, sister Rosa, and himself, were the only members of the Prauner family who came to America. John and Carl Prauner are pioneer homestead settlers in Madison county, and are now living in their pleasant home in Battle Creek, Madison county, Nebraska. Mr. Prauner was married to Miss Mary Eyl at the home of her parents in Madison county, May 9, 1875. The Eyl family were old pioneers of Madison county, of whom the parents and a sister are deceased; four brothers of Mrs. Prauner are living, two of whom reside in Madison county. Mr. and Mrs. Carl Prauner have had fourteen children, thirteen of whom are living: Fred, who is married, has three children and lives Madison county; Katie, wife of Charles Hagerman has five children; Annie, wife of Fred Bierman has three children, Charles, married, has one child; Mary, wife of Jake Knapp, has three children; all the aforementioned reside in Madison county; and Henry, Lena, Minnie, Rosa, George, Gustave, Lizzie, and August, who are living under the parental roof. The Prauner family are well known in Madison county where they all reside and are well liked by their neighbors, and occupy a high position in their community as worthy citizens. Mr. and Mrs. Prauner have fourteen grandchildren. Carl Prauner, although living in Battle Creek so as to give the children the best educational advantages, still finds time to direct the workings of his several farms and keep in active touch with his farm and stock interests. Mr. Prauner is a prominent member of the German Lutheran church of which he has been a trustee for many years. Among the best known residents of Custer county is William Gleason, now living retired from active life, at Ansley, and who is a veteran of the Civil war. Mr. Gleason was born at Reading, Hillsdale county, Michigan, September 13, 1836, son of Eleazer and Betsey (Berry) Gleason, the second of a family of ten children and the first white child born at Reading, the surrounding country at that time being inhabited by Indians. He now has a brother and a sister in Michigan and two brothers in Oregon. The father was a native of New York and died about 1893, at Reading. The mother, also a native of New York, died on the homestead in Michigan, in March, 1896. Mr. Gleason was reared on a farm, received his education in the local schools, and then took up farming as an occupation. March 21, 1861, he was married at Allen, Michigan, to Esther Russell, a native of the state of New York, and soon afterward they removed to Illinois, from which state he enlisted in August, 1862, in Company H, One Hundred and Fifteen Illinois Infantry. He served until the close of the war and received his final discharge at Camp Butler in the summer of 1865. He participated in many, important engagements, including those at Chickamauga, Resaca, Nashville, Dalton, and minor skirmishes and struggles.